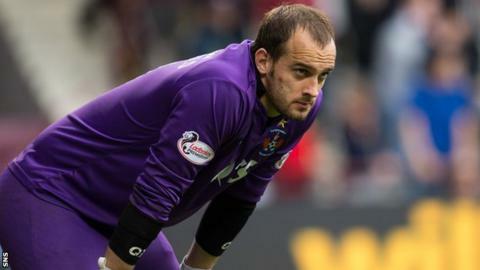 Kilmarnock goalkeeper Jamie MacDonald believes Celtic "could have" had a penalty as the pair played out a goalless draw on Saturday. Early in the second half, Scott Brown went down under the challenge of Killie defender Kevin McHattie, but referee Bobby Madden waved play on. "At the time, I must say I thought it could have been a penalty," MacDonald told BBC Scotland. "I thought Kevin clipped him; he's adamant he never." MacDonald and his team-mates were delighted to hold the league leaders at Celtic Park and the 29-year-old felt the visitors might even have stolen all three points on the counter-attack. "It's a great point," added MacDonald. "I think, if you're coming to Celtic Park, anything you can get is always a great point. "You always know Celtic are going to dominate possession and chances in games like this. "It was up to us to make sure we were tight and compact, which I thought we were. "We limited Celtic to very few chances and we could maybe have even had a goal ourselves at the end." After a woeful start to their Premiership campaign, Kilmarnock have twice drawn with Celtic, taken a point from a visit to Hearts and beaten Inverness Caledonian Thistle and Dundee respectively. "For us, we've proven we can compete with the best teams in the league," said MacDonald. "Twice we've drawn with Celtic now, we've had a great point at Tynecastle, it's up to us to try and get a bit of consistency in our game. "We'll win a few, draw one, lose a couple, and we just never quite get away from that bottom end of the table." MacDonald is hopeful Kilmarnock can take confidence from holding the champions. "Hopefully that can be a catalyst for us," he added. "We've got two big games coming up against Partick Thistle and Dundee United and, if we can win them, it'll shoot us up the table."